We've highlighted the noble, classically heroic characteristics of SUPERMAN, in striking contrast with BATMAN's complex dark aspect. The chest and cape utilize flexible materials, creating a wide range of motion. SUPERMAN's iconic take-off and landing poses are easily recreated. We've paid special attention to the fine details, keeping close accuracy to the design of the character in the film, such as the small Kryptonian insignia etched into the waist of his suit. The finishing touches are his accessories, including expressive interchangeable hands, and a face piece that features his powerful heat vision. 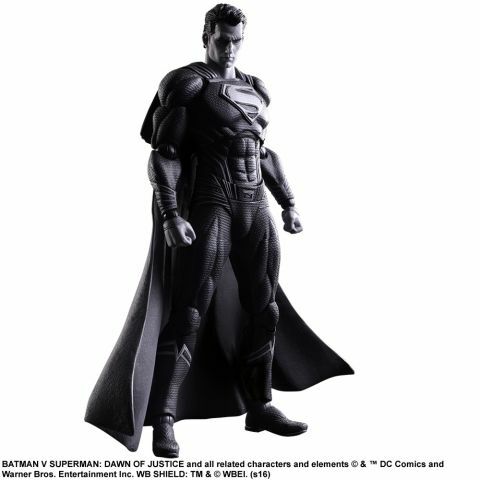 All this and more make this figure a superb depiction of SUPERMAN.